51552-PN is rated 4.5 out of 5 by 11. 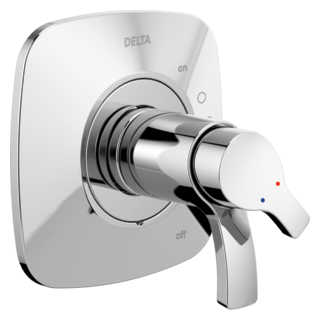 Rated 5 out of 5 by Divingyorkmom from Beautiful shower systems We absolutely love this shower system. It’s a beautiful addition to your shower. Unfortunately we had to change our bath plan up because of plumbing issues, and didn’t have the space for it all. Rated 4 out of 5 by Gretchen from Good contemporary design I love the classy design of all of the shower system components! Unfortunately, I would prefer a pressure rating higher than 1.7 GPM for the shower head and wand. 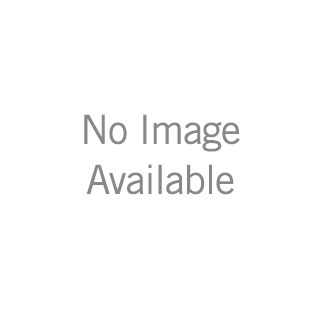 Rated 4 out of 5 by Gwoodman from Beautiful! 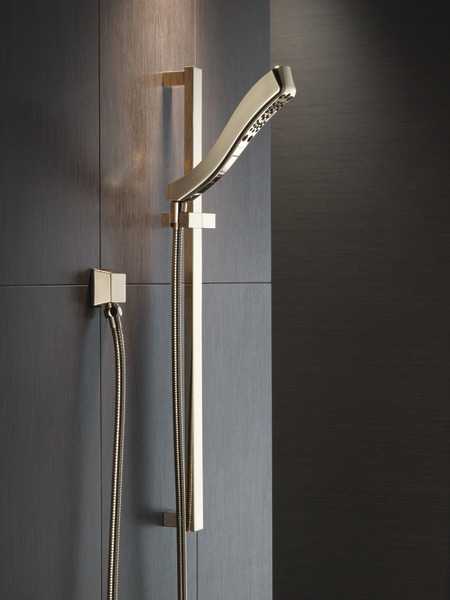 This hand shower goes perfectly with the rest of our Tesla system. We’re very happy with our entire purchase of a matching set for each of our bathrooms. Rated 4 out of 5 by Dantherenoman from Elegant and effective handheld shower Incorporated this handheld with a rain shower style overhead shower head using a 3-way valve. 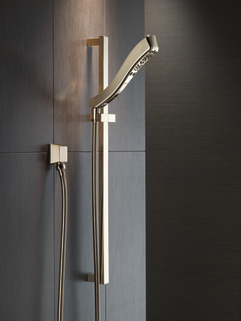 Best feature is ability to have flow to both the std shower head and the handheld. Gets water exactly where you want it without shutting off the rain shower. Great combo. Nickel finish is not as spot resistant as I hoped for, but easy to clean. 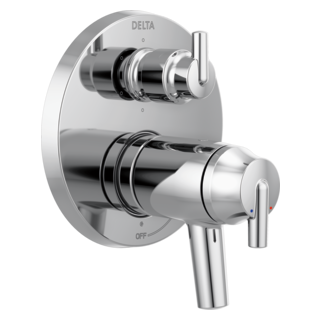 Delta components are high quality and should last a long time. Plumbing is all copper - sweated joints mated very well with brass/bronze valves. Rated 5 out of 5 by CSTH from Quality finish Anxious for the install scheduled next week. Item appears to be top quality, and will look great in the shower. If the water flow is a great as the finish, it is a win. 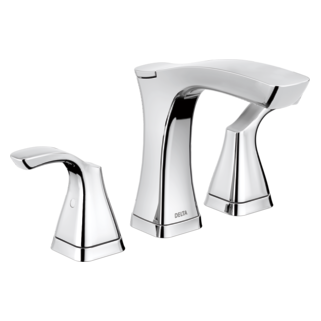 Rated 5 out of 5 by Dreamhome from Excellent product I bought this for a bathroom remodel and couldn't be happier. 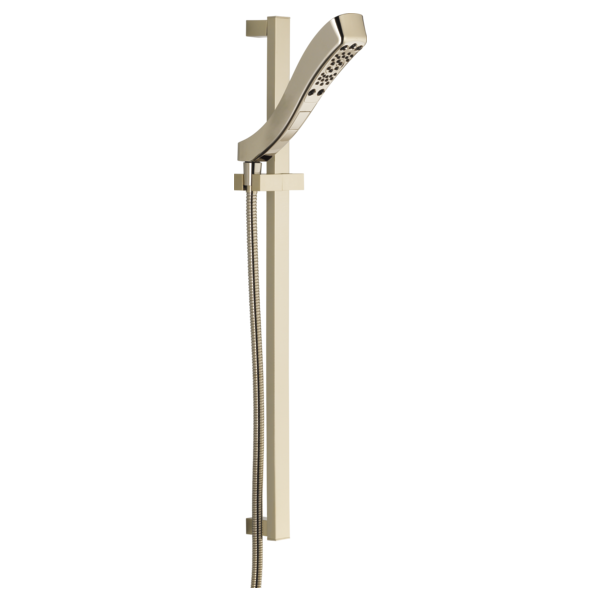 The design is beautiful, it is functional and sleek. Highly recommend! Rated 4 out of 5 by LMF17 from Modern Look The modern look was what we were looking for, and the installation was easy. What kind of trim is used with this if there is not a shower head? Can you use the Tesla side bar as a Grab Bar? Not by ADA code but in case you slip can you grab? 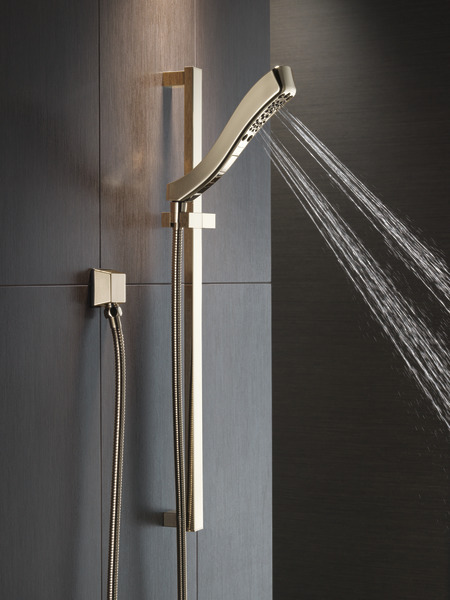 Can the angle of the showerhead be adjusted? If so, what are the limits of its movement? Will this head rotate left to right so that it could point towards a shower bench or to the shower floor center. I wasn't quite able to tell since the bar is square. I assume the head will move left to right? Thanks! 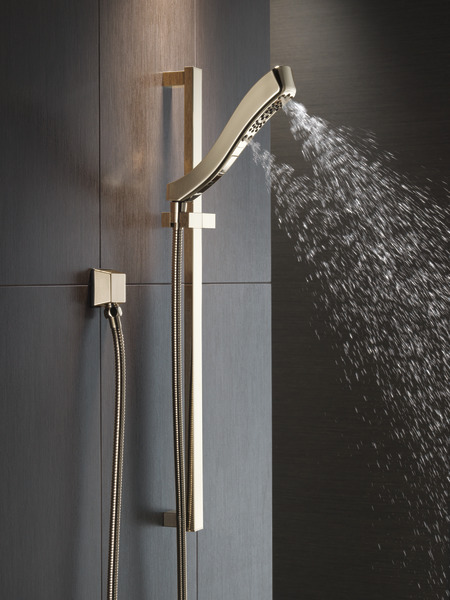 Is the shower bar adjustable up and down? Is this sufficient as a stand alone showerhead? or is it only for accessorizing with a standard showerhead?